Winifred Elizabeth (Manning) Allbeck —“Snicklefritz” as her papa nicknamed her—began her life in the dead of winter when the world was being torn apart by The Great War and devastated by the Spanish Flu, the worst pandemic in recorded history. Nearly 100 years later, she and her daughter, Ellen Allbeck Maurer, sat down to tell her intimate story—interwoven with grand changes taking place in American rural life. From kerosene lamps and one-room schools to the Great Depression, times changed—and so did her life. School years were followed by long-distance loves—captured through letters presented within the book—and her world expanded to include a happy forty-four-year marriage to Frank, whose tale blends into hers. The secluded life of the farm girl of the early 1900s eventually blossomed into adventures in more than two dozen countries on three continents. 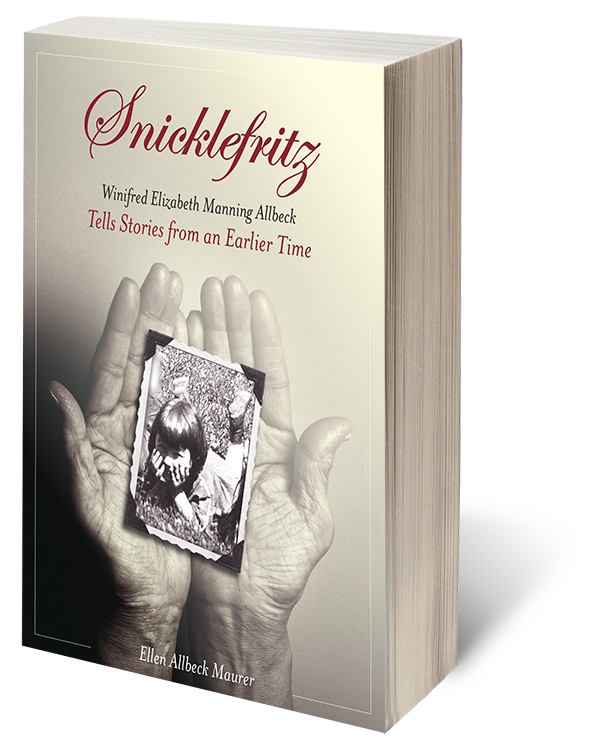 Snicklefritz relates comical anecdotes and tender memories in Allbeck’s own voice, and more than 1,000 photos, sketches, recipes, diaries, and letters illuminate the stories, just as the tales themselves shed light on a world that most of us have only seen in fiction.